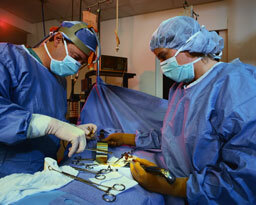 Paws 'N Claws Veterinary Clinic provides all types of soft tissue and most orthopedic surgical services. We routinely perform ovario-hysterectomy (spays), castrations (neuters), mass removals, amputations, enucleations, abdominal procedures, etc. We also repair lacerations, fractures, and abscesses. If your pet requires surgery, our doctors will make sure that you understand all aspects of the surgery and all options available. Itemized estimates will be provided. We take great care to make sure that the surgery to be done is actually necessary and formulate the best plan for your pet. We can handle almost all situations, or if a more specialized surgery is needed, we can help you with the process of referral to a specialist. If you have any questions regarding our surgical capabilities, don't hesitate to contact us. Each patient is evaluated for anesthetic risks prior to surgery. The anesthetics used are tailored to each patient to provide the safest procedure that we can, especially for our older or high risk patients. The patient's vital signs are monitored throughout the procedures. Our monitoring allows us to closely watch heart rate, ECG, respiration rate, and oxygen saturation. We take great care to make sure that your beloved pet is treated as if it was our own.